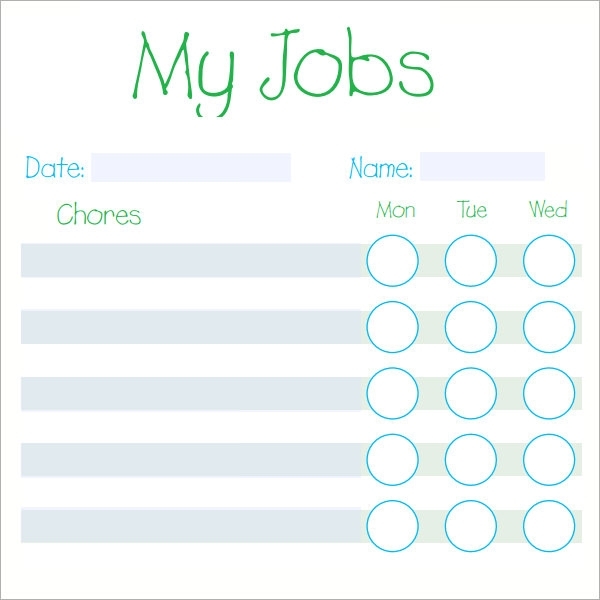 Chore list templates come handy to record daily tasks that have to be performed. These templates even have spaces to include the name of the family member who has to perform a given task. You can download the free samples and examples to choose the design that you want and get an idea on the writing style. You can also see Sample Price List Templates. This template presents theme based decorated layouts presenting a table with days of a week entered against the chores scheduled for a particular day. It is easily a favorite among teenagers engaged in sedentary chores of the household. 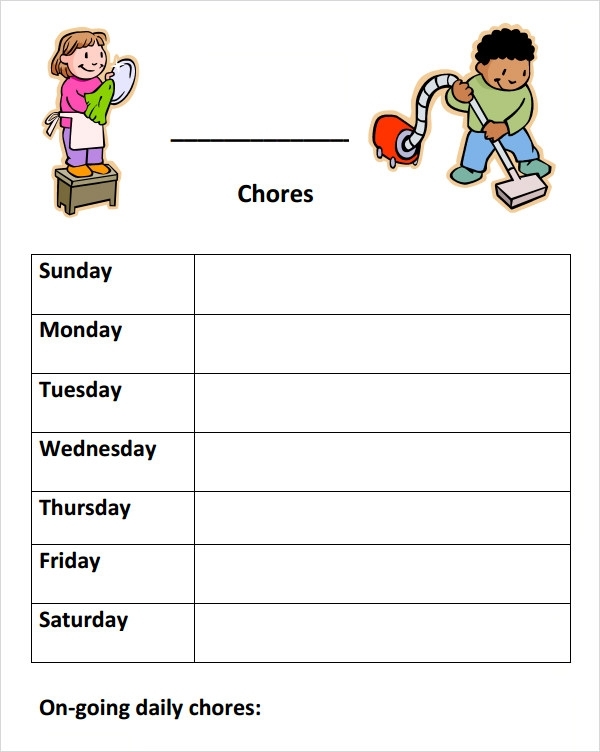 Smart kids use this template to keep a track of the number of days assigned for room cleaning and other chores. The document is a simple table displaying cartoon animations next to daily chores that attract the child’s attention towards pending work. This list features simple tables made for each week of a month enlisting chores in each row and days of a week in subsequent columns. This template is made on an Word spreadsheet with days of each week highlighted in different colors. 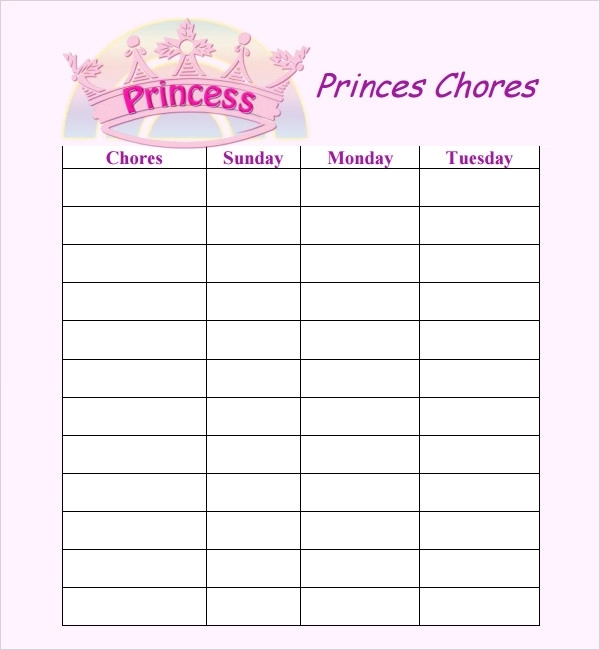 For housewives or maids who perform specific chores regularly can use this template. Here certain household errands are listed against box icons that can be ticked once the job is done. Besides these there are additional blanks where comments can be jotted down. 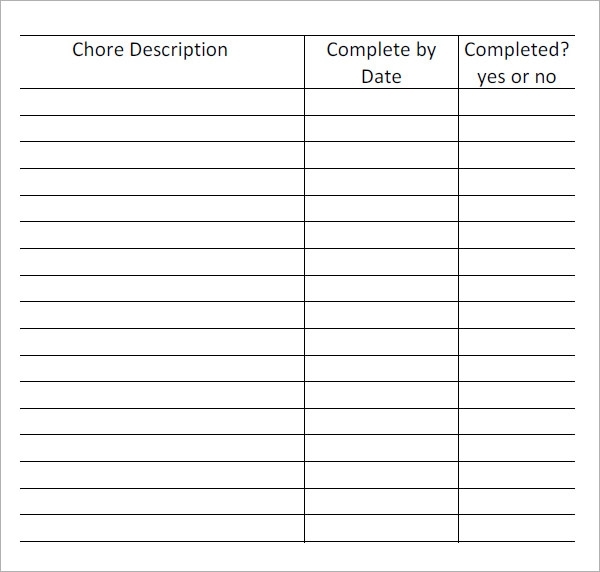 Who can use the Chore List Template? Housewives can reduce unwanted disorientation by using a weekly or monthly based chore list template. 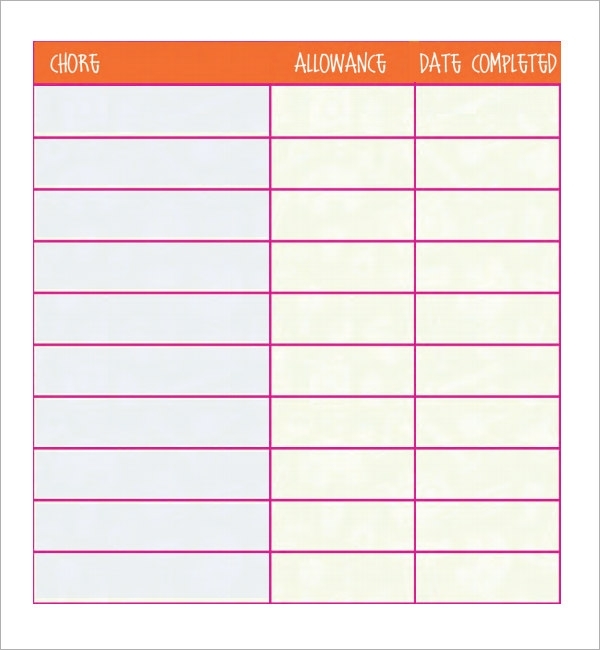 Kids or teenagers who earn pocket money from odd jobs or house chores can maintain a weekly task list using this template. 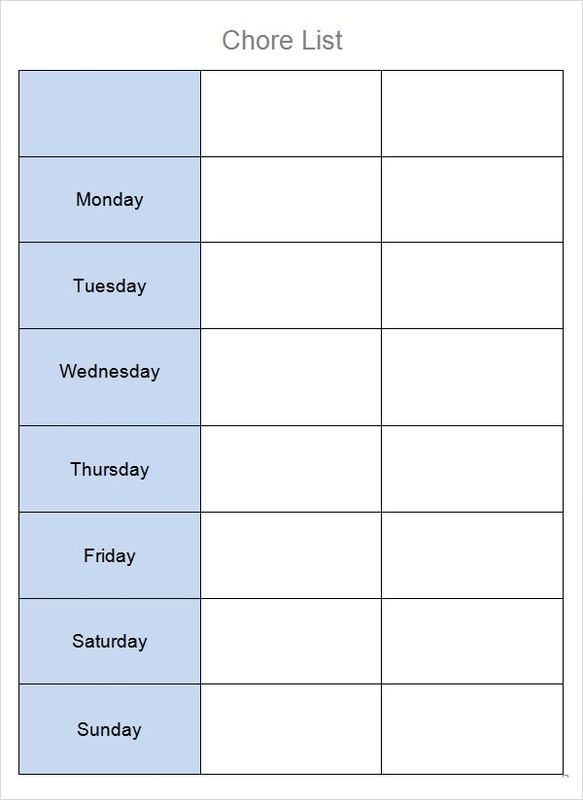 Working women who accumulate a week’s work till the weekend can use this template to create a weekly chores list to ensure an organized sequence of events. Men who assist family members in their chores can make a gist of errands they need to take care of using this MS word or Excel accessible document.You can also see Sample Packing List Templates. 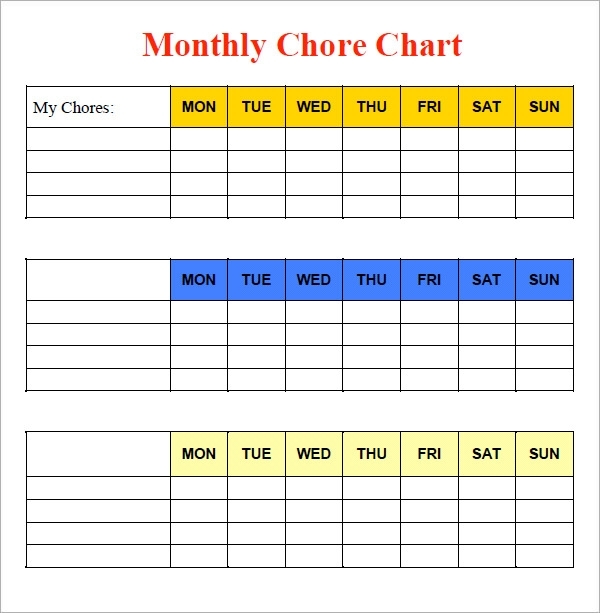 How to use the Chore List Template? This template is easy to use and efficient in keeping your schedule organized. According to your workload download a suitable chore list template. Enter your daily tasks in the appropriate cells of an already constructed table, you can change font color or cell size and highlight the days of a week. For the young ones, it offers a variety of graph icons and images that can be inserted to lend a cool look to the daily schedule.To use the template as a checklist, you can add box or circular icons and strike each one to indicate that you have done the needful. 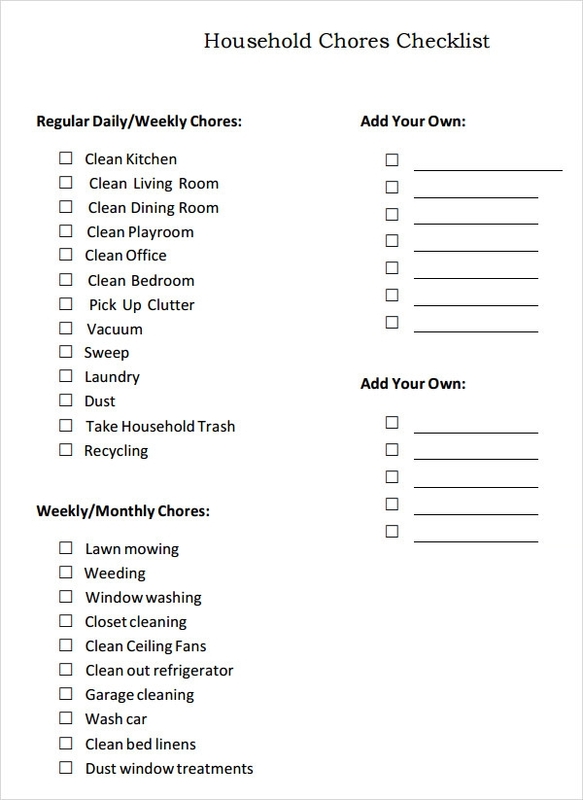 Why Should One Use The Chore List Template? A organized list of chores in and around your household helps you work prevent the usual confusion and “hotheaded” moments commonly occurring on a regular basis otherwise. This template helps you list every task along with the days of a week when it needs to be carried out. It is accessible using MS word and Excel, hence modifying its content shouldn’t b bother you with too much of time consumption. This template can be modified umpteen number of times according to your day-to-day schedule. 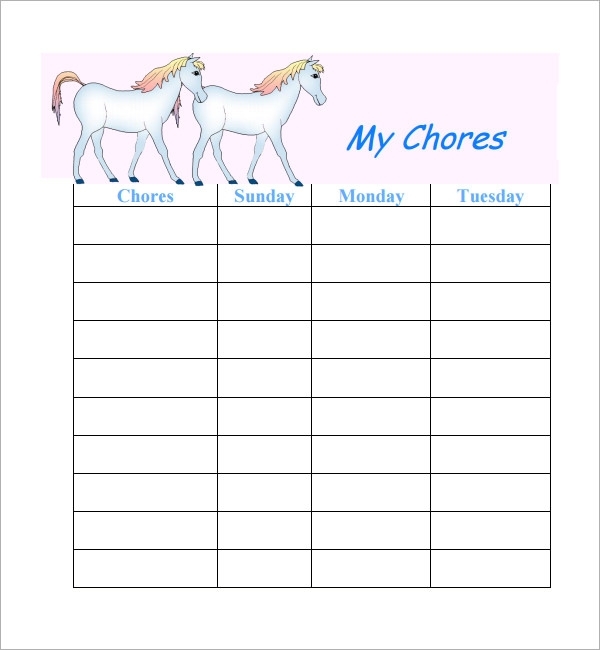 You can go on to add self-motivating captions or images in case the chores are listed to be done by your child.You can also see Sample Shopping List Templates. These templates are available for monthly, yearly, weekly or daily addressing of chores. You can cut down the time that is required to perform the tasks by dividing it among your family members with these templates. These are available in both word and excel format. Don’t forget to stick them on the refrigerator door or any other place where all family members can see it!